When a CIO or an IT Executive takes over a new job one of the greatest challenges is to quickly validate that the infrastructure that is in place. Would it not be nice to have some tools that could be use to quickly put proven world class policies in place with minimal effort. That is what the CIO IT Infrastructure Policy Bundle does. Gain control over your IT realm! Download a collection of over Janco's IT infrastructure and policy templates. Each can be modified to align with your needs. This comprehensive collection comes with a variety of highly-researched tools that will help you develop a complete guide that fits the unique needs of your organization and provides tools and suggestions for policy communication and enforcement. Defining Your Optimal IT Infrastructure is a critical task that can no longer wait with all of the changes mandated by PCI-DSS, HIPAA, ISO, ITIL, Sarbanes-Oxley, changing economic environment, and changes to enterprise operating environments. eJobDescription.com, working in concert with Janco Associates, has combine the policies that Janco has developed over time with some of the best IT organizations around the globe into a single package. With this bundle you get a PDF file that has all of the procedures in a single document that is over 300 pages long. It would take your staff months to develop these procedures from scratch. In addition you get a separate MS-Word document for each procedure which can easily be modified. Prioritize enterprise resources with a prescriptive toolset that lets enterprises focus their efforts in a cost effective manner. 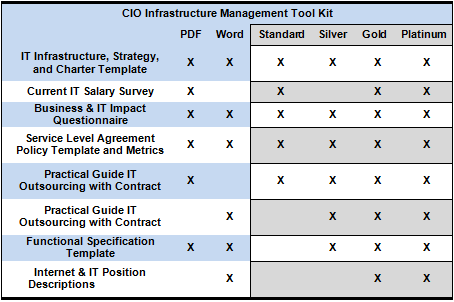 The CIO Infrastructure Management Tool Kit comes in four versions - Standard, Silver, Gold, and Platinum.